SanDisk is breaking new ground with a pair of microSD memory cards with 256GB of storage capacity and lightening quick transfer speeds. First up is the new 256GB Extreme microSDXC UHS-III card, which SanDisk claims to offer read and write speeds up to 100MB/s and at 90MB/s, respectively. If the speeds are true, it should be ideal for drones, phones and other small imaging devices as the company also boasts it can store up to 14 hours of 4K Ultra-HD footage. SanDisk also introduced 256GB SanDisk Ultra microSDXC card Premium Edition that's Class 10 and offers slightly slower 95MB/s transfer speeds, but users will still be able to transfer 1,200 photos in under a minute. 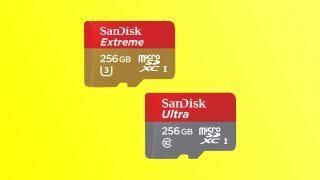 Unlike the Extreme microSD card, the Ultra is more focused on adding secondary storage for Android phones and tablet rather creating new media including up to 24 hours of Full HD video. Along with storing tons of data, the new cards are designed to be waterproof, shock proof, X-ray proof and heat resistant. Both cards are also compatible with the SanDisk Memory Zone app for Android, which allows users to manage and backup content on the device. The 256GB SanDisk Ultra microSDXC UHS-I card, Premium Edition, will release worldwide in August 2016 for $149.99. Meanwhile, the 256GB SanDisk Extreme microSDXC UHS-I card will available later this year and is priced at $199.99.